I designed this stitchery a few months ago, knowing it would be the one I'd keep close to my heart during 2018. Last year was the weariest one for me as far back as I can remember, and it may have been for you as well. When extreme physical, mental and emotional fatigue is relentless over a long period of time I sometimes find myself in the deep darkness of the night weeping before the Lord, even suggesting He relieve me of this life. Depression sets in and I wrongly imagine my family would be better off without me because I look upon myself as a burden to them...but this is the depression talking, not God, not me when I'm in a normal mindset, so I never make life altering or big decisions when I am depressed. I wait upon the Lord to lift my countenance and like the storm He calmed on the sea, He always restores calm to my soul when I open the Scriptures and read the truth and life within. It may take a day, it may take weeks, but He always carries me forward, assuring me that until my eyes close on this earthly life He has work for me to do and a unique purpose to fulfill, a purpose He planned before I was even born. "This is for you, memorise it, come back to it, trust Me in that promise." With each stitch I found myself falling deeper in love with Father God, amazed at His everlasting care for me, one little person in a world of billions. Dearest, never, ever think you do not matter to God. You are precious in His eyes, far more precious and loved than you can ever feel about your husband, child, parent...His love is pure, complete, everlasting, encouraging, holy, and a free gift He will never take from you. ....do not grow weary in doing good. You will reap in due season. Trust His promises, always, for they are from everlasting to everlasting and cannot be withdrawn. I will frame this God-inspired design above my desk all year, a constant reminder of His words of life, words of direction, and words of promise for my simple life. You know, those dark nights of my soul have become less and less the more I'm learning to rest in Him, the more I rest from my own striving and concerns and transfer each one to Jesus, who is ready with open arms to carry my burdens if I simply let them go and put my trust in Him alone. There will always be occasions when my first instinct is to panic or try and plan a solution to a new crisis or challenge but Jesus will remind me to stop, breathe, make a conscious decision to hand it all to Him in prayer, and to rest while I wait for the right answer or direction to become clear. Already this new year has proved challenging in a few areas, but I know Who holds my future path in His care and that there is no reason to carry concern or worry. My prayer today is that you rest in Him, that you hand over to Jesus the problems, concerns, loneliness, needs, misunderstandings and all those things which weigh heavy on your heart...and trust Him to carry you lovingly and deliberately through each and every one. Download the pattern here as a free gift. 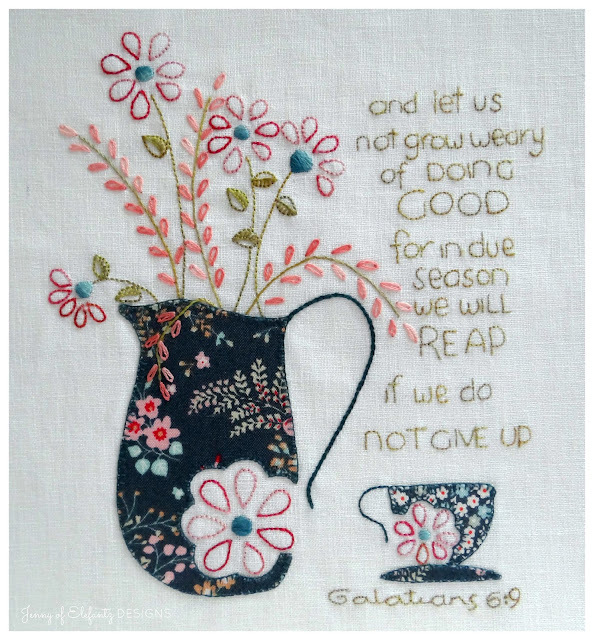 "And let us not grow weary of doing good for in due season we will reap if we do not give up." Ahh, Jenny, such good words. Thank you! These words are my 'place to go' since many many years, feeding and keeping alive my trust, hope, love in and for God and life. Jenny you have no idea how timely your words are. Mum and I have spent most of the night and morning at our local hospital. My father is now a frail blind man with advanced dementia. Last night he fell and hit his head. He required stitches but would not co-operate so glue was used. He now has a bleed inside his head. I won't go into the full story but now we are waiting to see if he gets better or not. Sadly he has been sent back to his nursing home and he won't be kept safe. That is the most frustrating part of this whole scenario. Sometimes sadness cools my soul and does not let me see or feel the warmth of God. Your embroidery is a good reminder for those moments. Thank you for helping us remember what is important. Hugs. Thank you Jenny. Your words always seem to touch my heart when I need it most. I am on a 2 1/2 week holiday for the first time in almost 40 yrs of nursing. I am taking time to slow down, visiting places I've always wanted to see and never been to, and I brought along God's word and my handwork for relaxing evenings. I am going to add this to my list and also hang it in my office when I get back as a reminder. 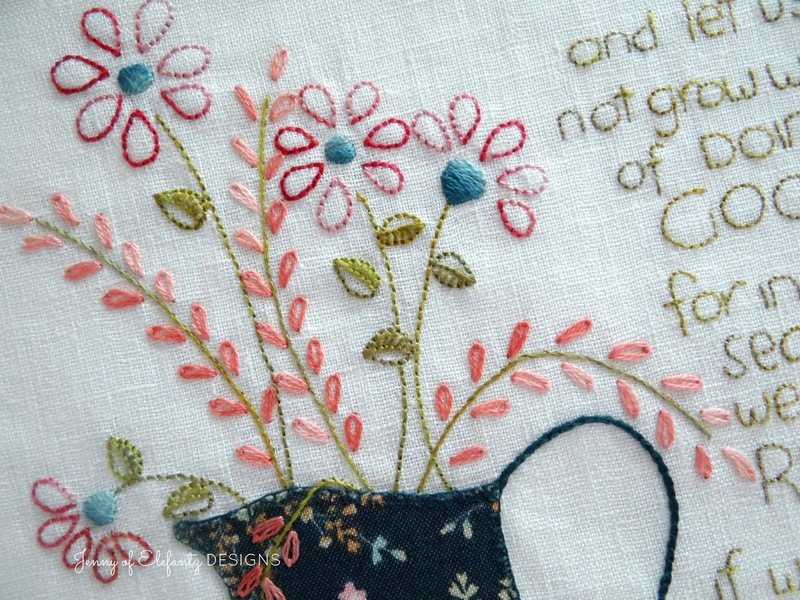 This is beautiful Jenny.... the stitchery and the post. Thank you. Amen! He is so faithful to us, just waiting for us to turn to Him. Often we don't realize all the groundwork He has laid for us while waiting for us to realize our need for Him. A lovely reminder of God's everlasting love for us. Thank you for sharing your journey with us. 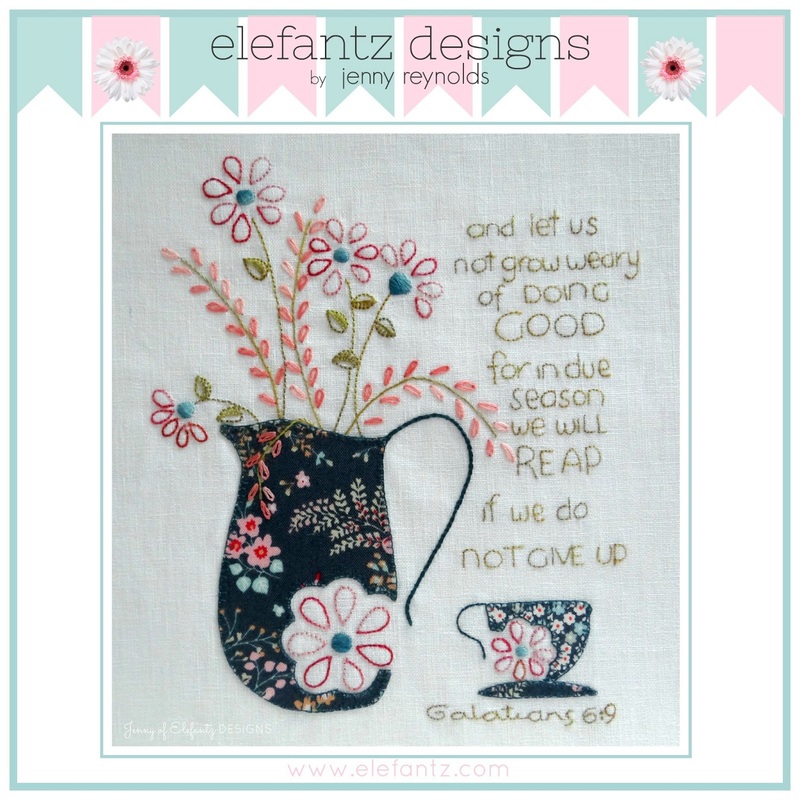 Thank you Jenny for the free pattern and for your encouraging words. Thank you very much for the encouragement and design. Wow! Such beautiful truth! So much love! As my heart is broken at this time in my life, I realize more and more that no one in this world cares more about my hurt and burden more than he does! Thank you for your words Jenny God Bless You ! One of my favorite thoughts, and so happy to have the stitchery to go with it. You are absolutely right. Each of us is known to our Father, just as we know each of our children. He never mixes us up, never forgets us, and never forsakes us. Even when we travel a long way distant from him, his hand is outstretched still to bring us back and love us, if we will let him. This is a beautiful stitchery, Jenny. It's perfect for looking at and remembering every day. I also like 1 Peter 4:19 when I am struggling. "Therefore let those who suffer according to God's will entrust their souls to a faithful Creator while doing good." Such a beautiful and apt post for me right now on many levels. Fortunately, I do not suffer with depression but I do find many things challenging and have to make a conscientious effort to stop feeling so negative, frustrated and impatient as it only serves to create dis ease in my body and soul. 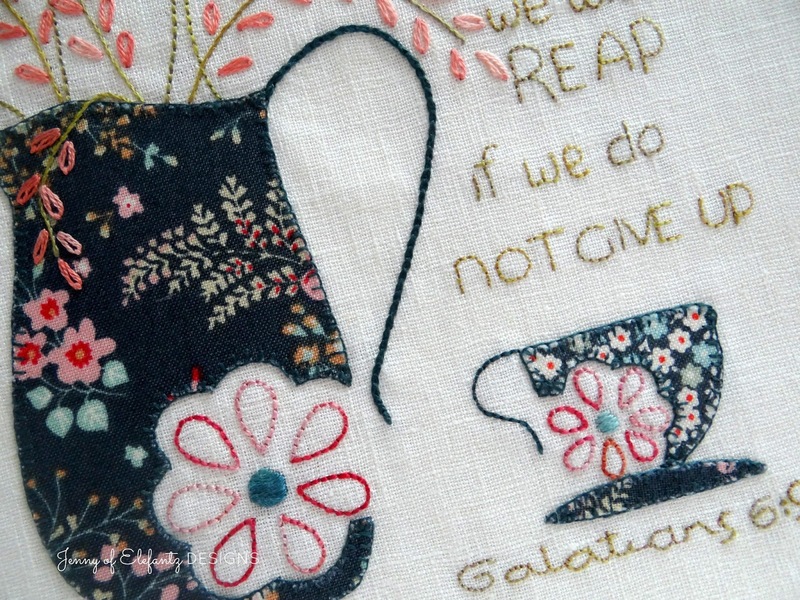 The stitchery is lovely and I rather like the darker colours chosen for the applique...quite different for you.😊Thankyou for sharing your words of wisdom and your beautiful design. Angel hugs. Thank you Jenny for the beautiful design! Your words and the scripture that you stitch is so comforting to me as I go through life's struggles. I am in a dark place right now and I needed comfort and you provided the kind words to help bring the tears. And tears are such a release for me. Thank you and bless you. You are such a treasure. Thank you very much Jenny for such a beautiful design, but above all thank you very much for your words. They come to me in a difficult moment in which I can not help but feel identified with your thought. Do not doubt that God uses you at all times as his tool although in many cases you are not aware of it. May He bless you always. Thank you so much for these words of encouragement. My husband suffers from depression, thankfully not all the time, bUT it seems to come in waves. Not having experienced it myself, it's taken me years to recognize it and really give him time to be weary and negative for a while, because I know that eventually he will feel normal again. It helps to hear what it's like from you, so I can be more compassionate and patient with him. Take care, and I hope that you have a wonderful start to this new year. Thank you so much....the Lord surely meant for me to read your post. I believe the year of 2017 was probably one of the worse years in my book of life. I, also, have felt despair, even believing at times, my family would be happier without me...yes, depression and stress can be so difficult. I’ve always believed that the Lord never gives you more than you can handle, but I started doubting Him. Thank goodness I have no longer feel this way, I am a forever optimistic person, and I believe I am stronger now for having endured this past year with its trials and tribulations. Again, thank you. 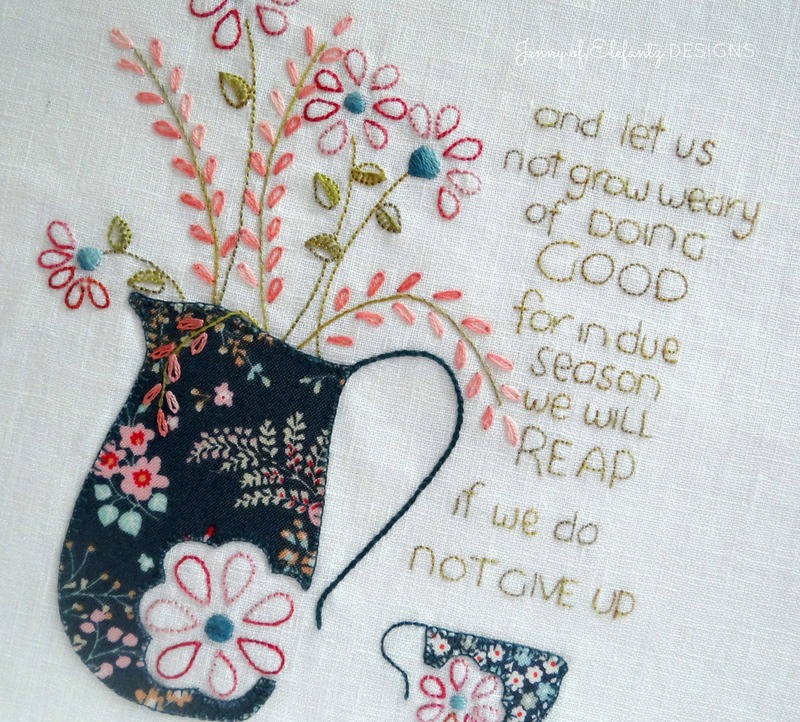 Thank you so very much for this lovely embroidery with special scripture! It really touched my heart - as did your post. Thankful for God's word and his strength. You are a blessing with your work, Jenny! Beautiful post and a gorgeous design! Love the scripture! Thank you so much for sharing your wonderful creativity. Hello Jenny; Your post really touched home in every aspect. Thank you for sharing this part of your life with us and with your scripture giving me another book of the Bible to study. I pray for you and your family often Jenny because I love you as a Christian Sister and regard you as the guide The Lord has chosen for me to Listen to and Learn from. Thank you also for this beautiful pattern you are sharing with us. I will have to pin this one until a little later. I am working on two other free patterns you have shared with us. One of them being the new BOM, the other was found in your Craftsy site and it was also free. Your are such a special giving individual Jenny! Thank You and have a fantastic day! Thank you for the beautiful design and the scripture makes it even more beautiful. So thankful for creative people like you who are willing to share their talents. Just come across your post Jenny. Your words give such comfort and inspiration to so many people who will never meet you yet we feel we know you and you know us. It's such a blessing to have you and your lovely blog to support and help people face the day whatever it brings. God bless!